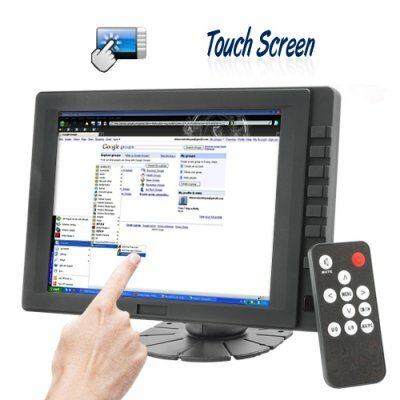 Successfully Added 8 Inch Touchscreen LCD Monitor (PC, POS, Media Remote) to your Shopping Cart. This 8 Inch LCD provides the same functionality as your computer monitor but with the added benefit of a touch screen! Small and powerful, this LCD monitor is perfect for your home, office, or business use. Completely change the way you work and play with this amazing product! The E56 8 Inch Touchscreen Monitor is the perfect addition to your home entertainment center. It can be used as your control center to access all your favorite computer files such as music, movies or pictures, all from the comfort of your sofa or bed! Simply connect your computer to your TV and use the E56 to effortlessly access your media files at the touch of a finger! This is the home entertainment solution of the future! A touchscreen monitor is great for your office too! Get the benefit of two monitors at your work desk without the drawback of using up your precious work space. Use your normal computer monitor to surf the web and the E56 to access your email account or monitor the stock market. Efficiency at the office has never been easier! For the business environment, the E56 becomes a complete money and time saving solution! Used as a POS (Point Of Sale) device, this monitor can eliminate human errors such as lost orders, math errors or other costly delays. Use a few of these in your retail store and customers have an interactive display to access your product information or can simply enjoy your interactive product demonstration! This is the same touch screen technology that is taking the retail industry by storm! This monitor is built with a durable reinforced polymer mold and high quality electronics. The screen is bright and clear and the response from the touch screen is both fast and accurate. Order one today and when you fall in love with it you can order a few more! Is it easy to install this LCD touch screen in my car? Yes, you can place it anywhere you wish. It is provide with a mounting plate which has a foam rubber adhesive bottom so you can fix it on any flat surface. If you need to make use of the LCD touch screen monitor somewhere else, is can be easily detached from the base and taken out of the car. Is it easy to install at my work desk? Yes, it can be placed anywhere you wish. It is provide with a mounting stand which has a foam rubber adhesive bottom so you can fix it on any part of your desktop. By rotating the screen left or right you can make sure you always have it rotated to provide easy access to the information you want. Can this LCD touch screen monitor be used for film making purposes? Yes, this 8 inch LCD touch screen monitor is the perfect tool for location and studio filming. It provides flexible viewing in a size that is easy to mount on top of cameras or hold in your hands. Can I use touch control on other electronic devices with the CVMW-E56? No, the touch control can only be used on a computer, as for other electronic devices, you can use the CVMW-E56 as an extra monitor.